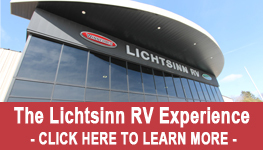 If you are the adventurous RV'r and camp with obstructed views of the Southern sky, we recommend a fully automatic portable satellite than can be positioned any where near the RV! Call 1-800-343-6255 to order one of these satellites today! The KING tailgater automatically locks on to broadcast satellites, allowing you to begin watching channels soon after setting it up. It requires no external power cable, and a single 50' cable connection is all it takes to begin watching satellite programming. If you add a second receiver, the Tailgater portable satellite antenna lets you watch different channels on separate televisions. 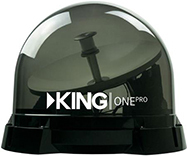 This small, easy to use, fully automatic antenna gives you the freedom to take your favorite DIRECTV or DISH programming with you on the road. It supports multiple TV viewing with a fully automatic satellite acquisition. Includes a 50' coax cable with connectors pre-installed and a power inserter. Use as either a portable or roof mount. 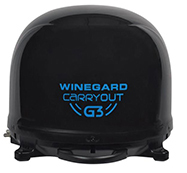 The Carryout G3 receives DISH, DIRECTV, and Bell TV programming for the ultimate in provider versatility. The G3 supports multiple receivers so you can watch different programming from the same satellite on multiple TVs at once. Simple setup, ultra-small and compact. Includes a 25' coax cable and a 3' coax. Need Some Help Finding the Right Satellite for you? *Prices are subject to change without notice per Winnebago's discretion. Please call to confirm pricing.